Hiya guys! I hope all is going well as we inch our way closer to the weekend. I'm definitely looking forward to some rest... and shopping. Mostly shopping. Unless my hubs is reading this right now then I'm so kidding! No really, RIP wallet. Of course I am here today to be an enabler in hopes you'd join me in burying our wallets. 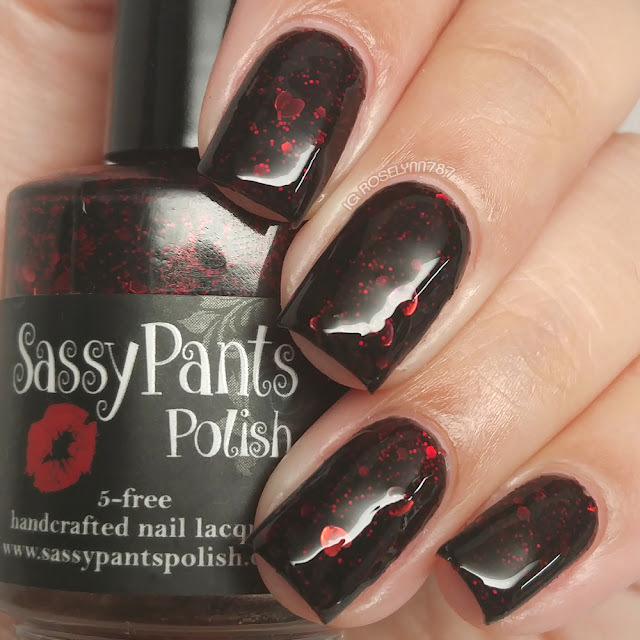 Today I am sharing the six-piece collection from Sassy Pants Polish just in time for Valentine's Day called First Crush. Let's take a look! 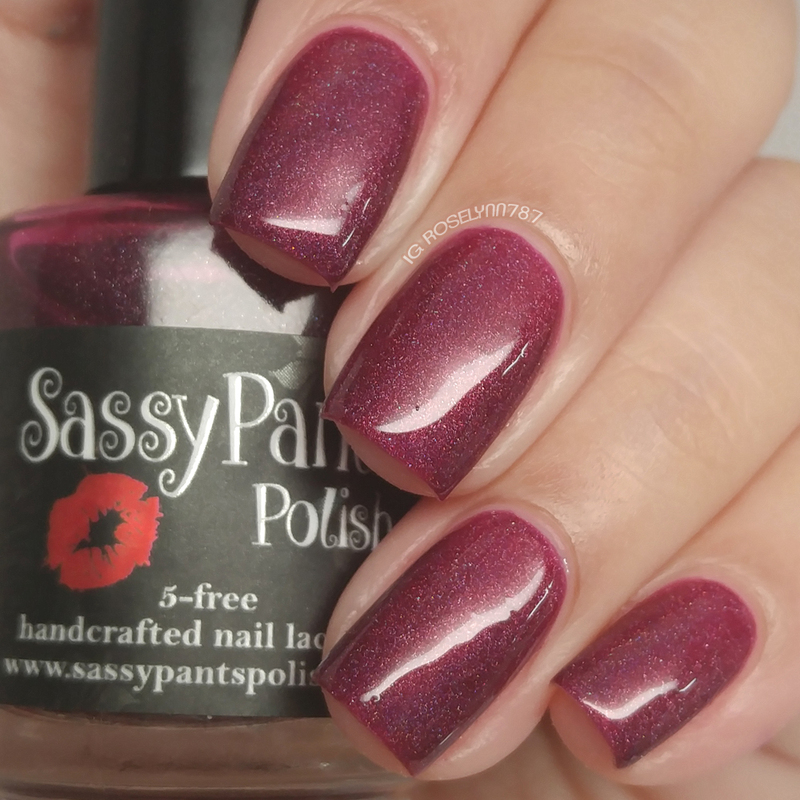 The First Crush Collection by Sassy Pants Polish will be available for purchase Friday, January 15th at 2PM CST. 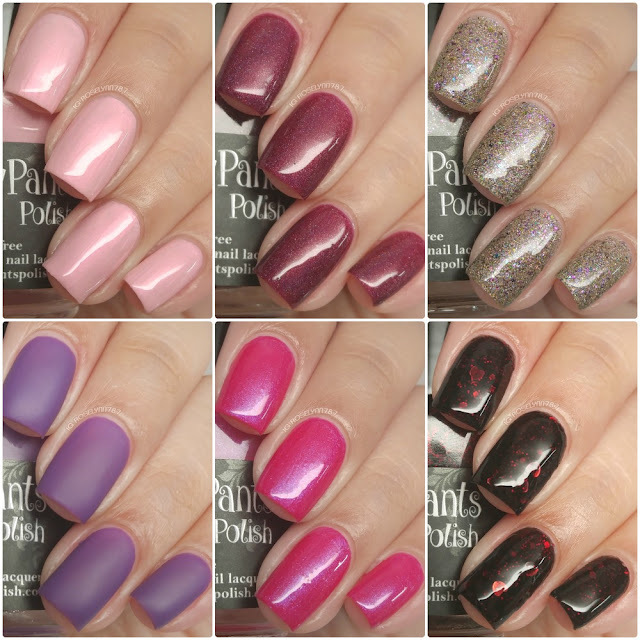 Each bottle retails for $10.00 for full-size (15ML) and $6.00 for mini-size (5ML). The entire full size collection is $60 and includes a free Manicure/Massage Candle by Handmade Natural Beauty. The shop also offers free shipping on orders of $50+ US only. First Kiss can be described as a baby pink polish with opal shimmer. I adore the softness in the tone, the shimmer adds a nice touch to the finish as well. The formula and consistency are great and it has a smooth application, and it dries to a kind of satin matte finish on its own. Shown here is two to three coats with a glossy topcoat. 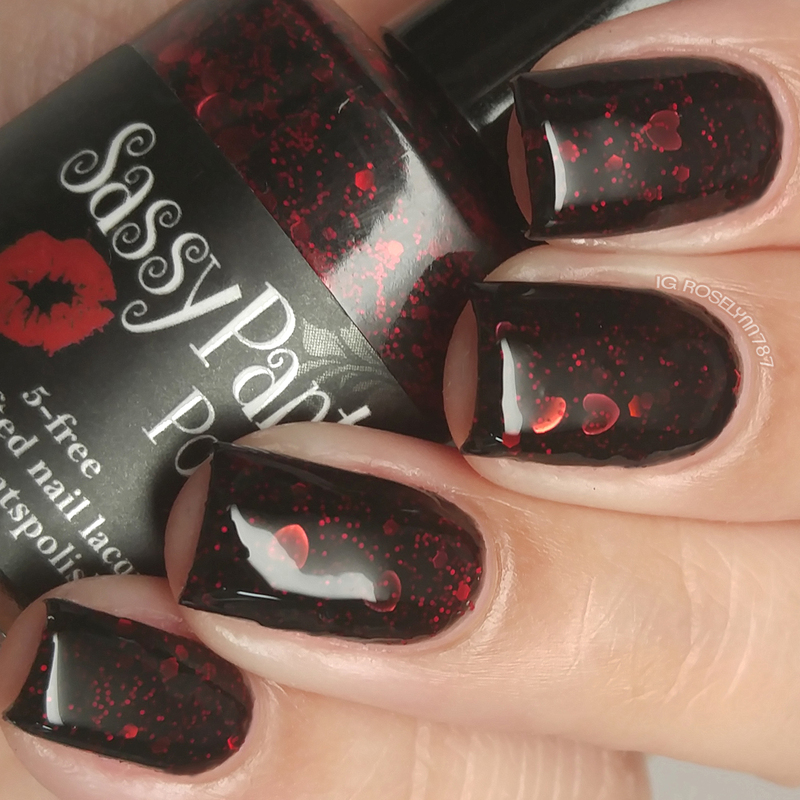 Forbidden Love can be described as a black jelly base packed with red micro glitter and various sized holographic glitter. The consistency is sheer as expected for a jelly, but it does build up really well. It is very glitter heavy so the formula leans a little on the thick side. One thing I'd like to note is that the finish ends up being extremely gritty on its own even after two layers of topcoat. Shown here is two coats with a glossy topcoat. 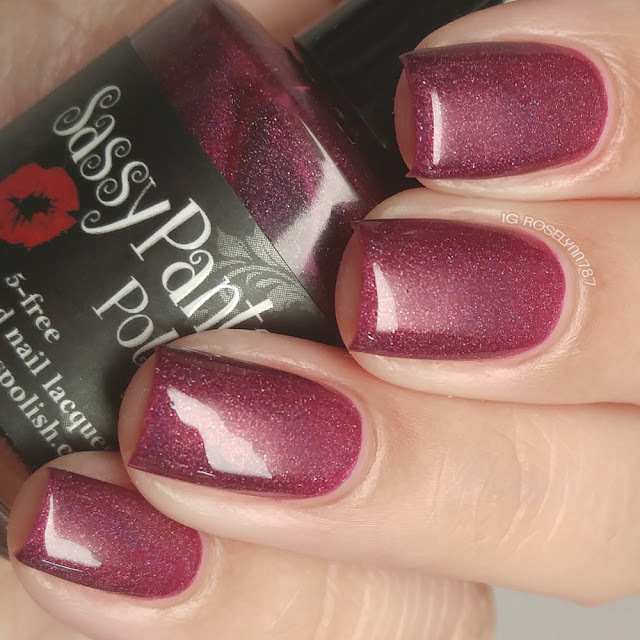 Kiss Me can be described as a berry red semi-sheer linear holographic polish. These photos were taken inside a light-box so they don't do the holo finish any justice. Formula is on the sheer side, but it builds up nicely and does become opaque with a few layers. The consistency has a nice balance between thin and thick making the layers glide on with ease. Shown here is three thin coats with a glossy topcoat. 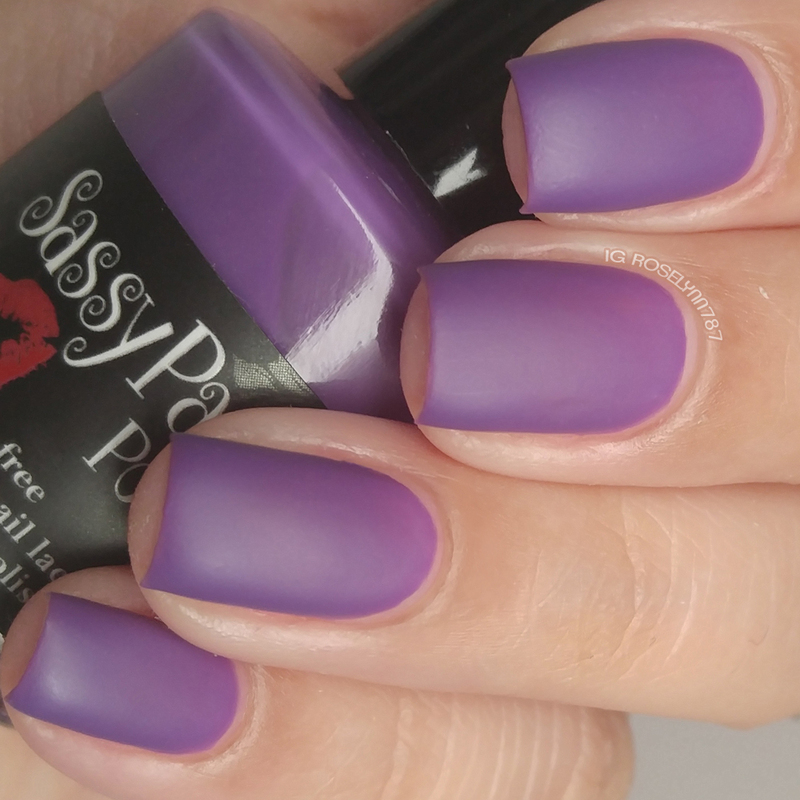 Pucker Up can be described as a violet purple matte creme. So much love. I mean really, who isn't going to love such a lush purple. Now although it is described as a creme it does have a bit of a jelly consistency in application. The formula initially applies patchy, but ends up self-leveling on its own. It dries to a matte finish on its own so I decided to show it naturally, but you can definitely top it with a glossy topcoat as well. Shown here is two to three coats without any topcoat. 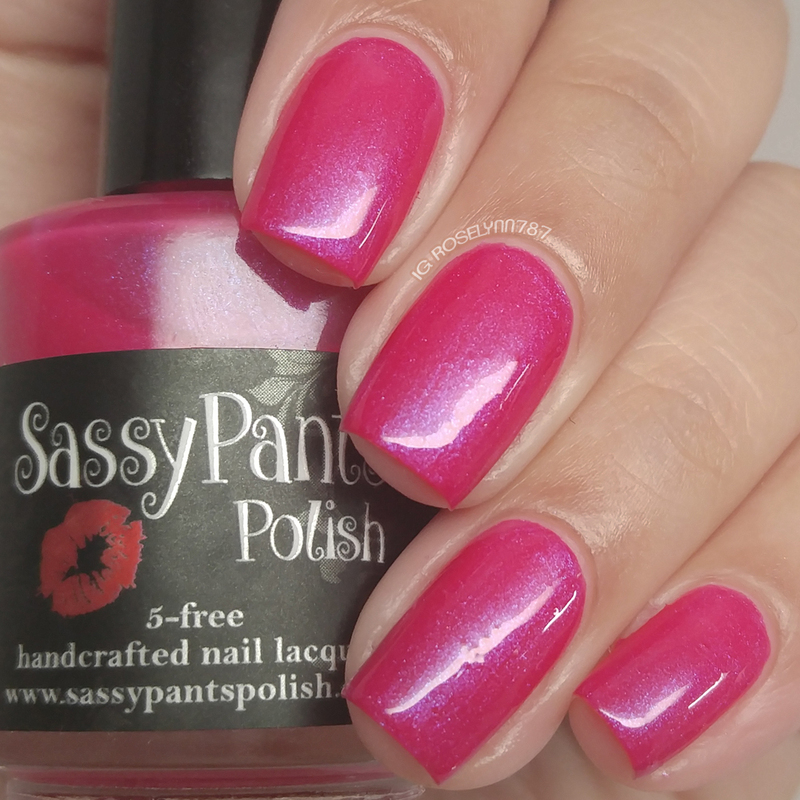 Tease can be described as a bright pink polish with blue shimmer throughout. I have a few other similar pinks in my collection, but none where the blue shimmer is so vibrant. Definitely don't have to angle your hand a lot, it's just there shining beautifully against the pink. Again, really nice formula in this polish as well. 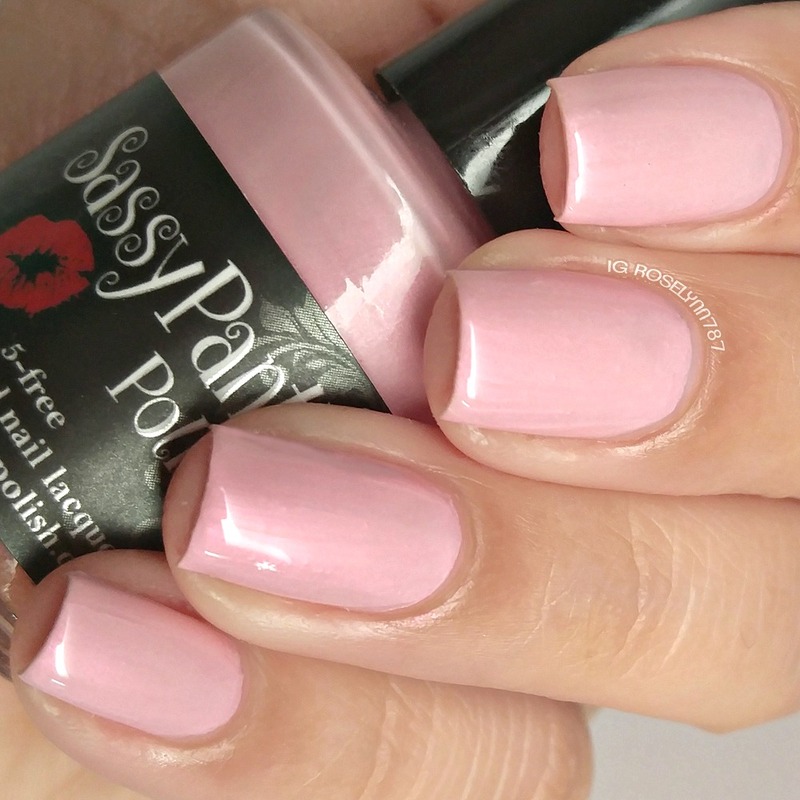 The consistency is good and goes on the nail very opaque. It dries to a kind of satin finish. I can really see this being gorgeous topped off in matte, can't you? Shown here is two coats with a glossy topcoat. 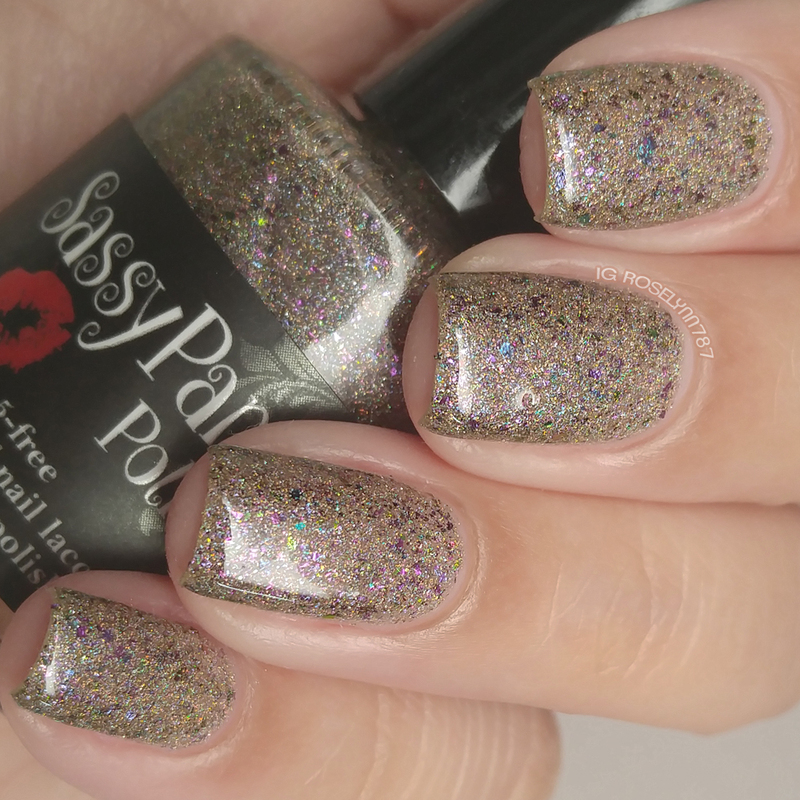 Temptation can be described as a gold and silver scattered holographic base with pink and gold flakies. 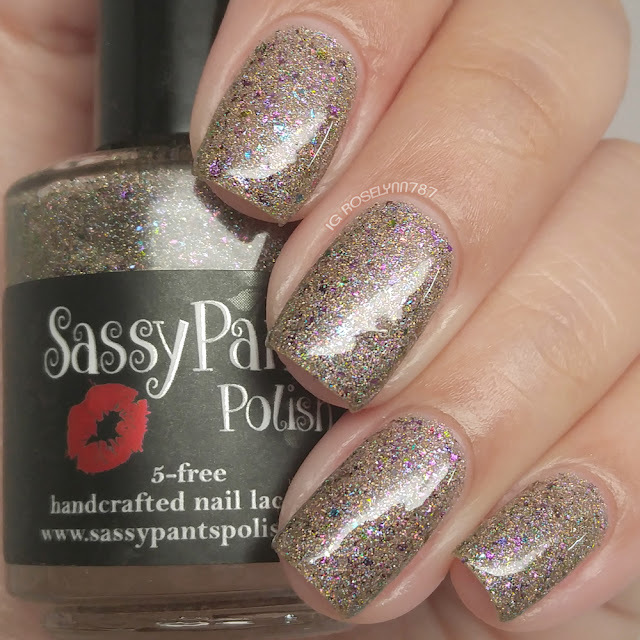 Although it's intended to be a sort of glitter topper, this actually builds up perfectly on its own as well. The formula and consistency are fantastic, really smooth and not too thin or thick. It's also surprisingly opaque so if you're using it over a base then I'd suggest doing only one coat. Shown here is two coats with a glossy topcoat. Overall I am really excited about this entire collection! I feel throughout the review I had to refrain from saying "Okay this is my favorite, no this is my favorite" over and over again. I cant think of many six-piece collections where I love every single one of the polishes. Definitely can see myself wearing and using them for Valentine nail art. There is a lot of nice range in the collection to mix in with the super girly pinks. But tell me what do you guys think? Do you think you'll be picking up this collection? Oh, these are pretty! I really love temptation! So cool you loved them all! Temptation really, well tempts me! These are really pretty! I think my favorite is Tease, followed by Forbidden Love, then Pucker Up. Your swatches look great! Temptation looks so cool all by itself! First kiss is pretty amazing. Ohh I LOVE Pucker Up! This looks like a really great collection! Pucker Up and Temptation are fabulous!